BiO-LiFE A.B. Adult Gold Pre & Pro is a food supplement containing both prebiotics and probiotics especially for senior citizens. 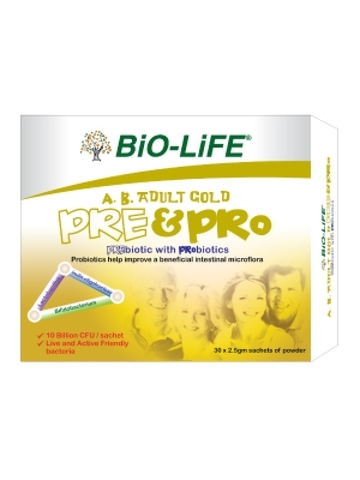 It contains 4 clinically studied ingredients namely chicory inulin (prebiotic), oligofructose (prebiotic), Lactobacillus plantarum LP-01 (probiotic) and Bifidobacterium lactis BB-12 (probiotic). The combination of both prebiotic and probiotic, termed synbiotic carry many beneficial effects on the human body which includes the enhancement of immune system as well as vitamins and minerals absorption particularly calcium, boosting bone health. The prebiotics, inulin and oligofructose-enriched powder help to promote the growth of beneficial bacteria in the gut. The presence of oligofructose helps the older adults to enhance the calcium absorption. The probiotics, Lactobacillus plantarum LP01 and Bifidobacterium lactis BB12 help to improve a beneficial intestinal microflora and inhibit the growth of pathogenic bacteria. Besides, probiotics are able to survive, grow and colonize in the digestive tract hence maintaining a healthy balance gut flora. 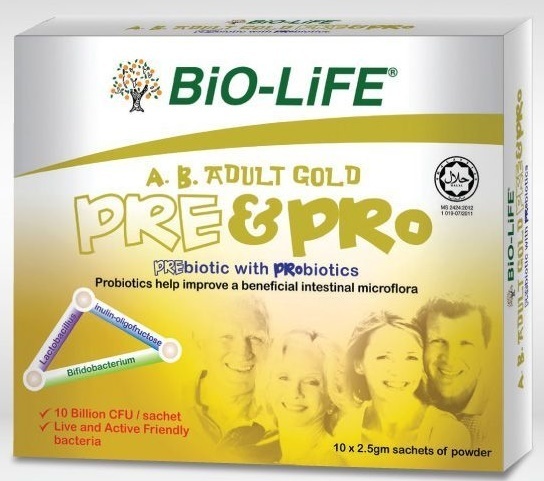 Both probiotics strains were extensively studied and found to be suitable for senior citizens. 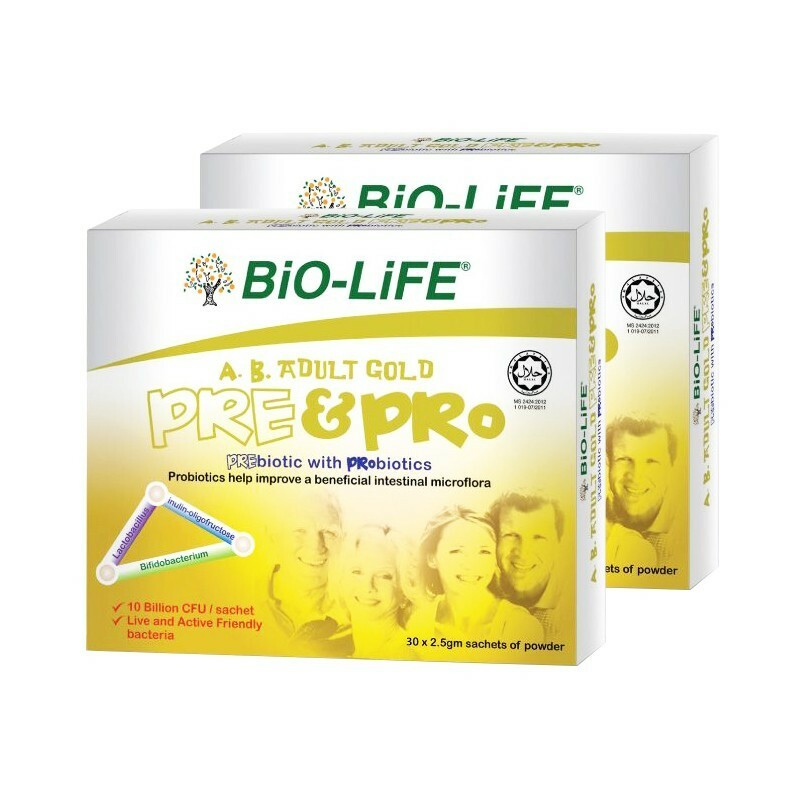 The triple care formula (Lactobacillus plantarum LP-01, Bifidobacterium lactis BB-12, inulin-oligofructose) also contributes to the improvement in nutritional status and bowel movement. Take 1 sachet daily, ½ hour before meal. Mix the contents of the sachet with any cold beverage or water. 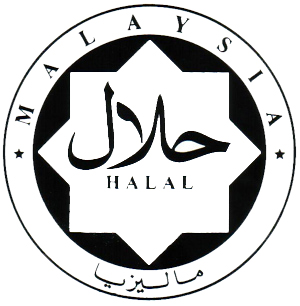 Do not exceed 5 sachets a day. This is a BACKORDER items.